That's all from BBC Africa Live for now, but you can keep up-to-date with the latest developments in Sudan and other stories from across the continent by listening to the Africa Today podcast or check the BBC News website. You don't need to teach a snake how to lie down." And we leave you with this picture of a Sudanese woman handing a soldier a bottle of water during a rally demanding a civilian body to lead the transition to democracy, outside the army headquarters in the Sudanese capital Khartoum. 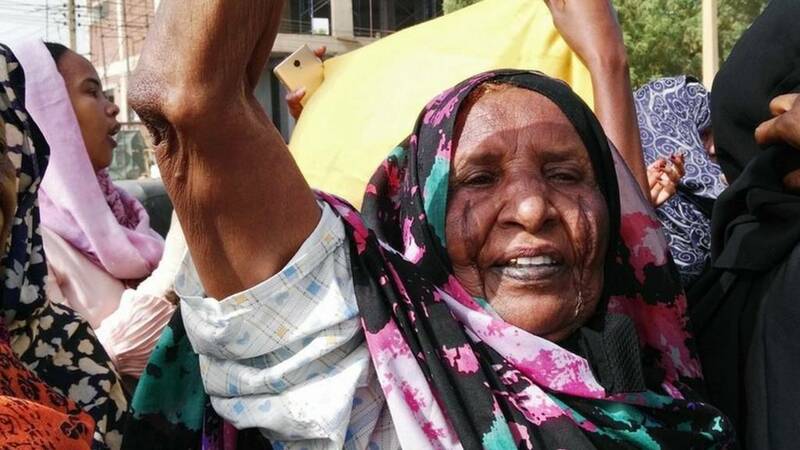 Our colleagues at BBC Focus on Africa radio have been speaking to a Sudanese protester to get her reaction about the offer by a senior member of the military council, that took power on Thursday. Lt Gen Omar Zain al-Abidin said that the army will help the protesters to achieve their aspirations, but would not tolerate chaos. Quote Message: The sit in, it’s gonna be the same tonight and every night. The statements [by the army], the decisions that have been set are absolutely unsatisfactory. It’s just a change of faces so nothing changed. The sit in, it’s gonna be the same tonight and every night. The statements [by the army], the decisions that have been set are absolutely unsatisfactory. It’s just a change of faces so nothing changed. Quote Message: Everything is still the same for us. Right now the faces involved in the security council – they’re still the same people that have been involved in killing the protesters… and they’re part of the regime. Everything is still the same for us. Right now the faces involved in the security council – they’re still the same people that have been involved in killing the protesters… and they’re part of the regime. Quote Message: The fact that the president is not in place anymore and they bring his vice president to become our new president is not satisfactory. The council that has been formed is of all the members who have been attacking the protesters on the streets for the past few months. The fact that the president is not in place anymore and they bring his vice president to become our new president is not satisfactory. The council that has been formed is of all the members who have been attacking the protesters on the streets for the past few months. Quote Message: They must go. From day one the demands have been clear – they must go. They cannot be inclusive. They’re the people who have destroyed Sudan and they cannot fix it. They must go. From day one the demands have been clear – they must go. They cannot be inclusive. They’re the people who have destroyed Sudan and they cannot fix it. Quote Message: What we’ve heard is there’s a split inside the military. A lot of officers are on the side of the protesters but the head officers are still part of the regime. The regime is still in places. They just replaced al-Bashir so it’s still not satisfactory." What we’ve heard is there’s a split inside the military. A lot of officers are on the side of the protesters but the head officers are still part of the regime. The regime is still in places. They just replaced al-Bashir so it’s still not satisfactory." The listing of Jumia, Africa's largest e-commerce firm, on the New York stock market is a watershed moment for the continent, a top US investment analyst has told the BBC. Rosa Whitaker, who was first ever US assistant trade representative for Africa, who now runs her own investment firm specialising in Africa, said that US investors should see the listing as an opportunity. Jumia is listing 17.6% of the company at $14.50 a share, giving the company "unicorn" status - which is the term used for a technology start-up worth $1bn-plus. In another interview, Tokunboh Ishmael, the chairperson of The African Private Equity and Venture Capital Association, told the BBC that Jumia demonstrates what's possible - what can be developed - and highlights the enormous opportunities in Africa. Ethiopia has foiled a planned attack by suspects backed by Islamist militant group al-Shabab in the capital, Addis Ababa, its attorney general has said. This is a promotional video of the park shared on YouTube. The ouster of Sudan President Omar al-Bashir is the latest successful coup in that country. Mr Bashir himself took power following a military coup in 1989 and prior to that there had been 13 coup attempts in Sudan, some successful and some not. BBC's Reality Check team has been looking back at Sudan's history of military interventions, and the wider picture across the African continent. The Africa Cup of Nations draw takes place on Friday 19:00 GMT with many fans waiting to discover their countries' fate. The tournament, which is in Egypt, is the biggest yet with 24 teams and the first to be held in Europe's summer rather than January or February. More on this story on the BBC African football page. Will the ICC's highest-profile fugitive face trial? The toppling of 75-year-old man Omar al-Bashir as Sudan’s president has raised the possibility of him standing trial before the International Criminal Court (ICC), where he’s wanted on charges of genocide, war crimes and crimes against humanity allegedly committed in Darfur. He was the first sitting president of a country to be indicted by the ICC and the first person to be charged with genocide. Mr Bashir, who denies the allegations, has been wanted by the ICC in The Hague for more than a decade. The fact he’s continued to travel extensively throughout Africa and the Middle East has served to highlight the impotence of a court, which depends upon countries co-operation to actually arrest and surrender suspects. So what hope of that happening now? Lt-Gen Omar Zain al-Abidin, the head of the political military committee, addressing a press conference said, "Bashir will be tried in our judicial system”. You can understand their logic based on self-interest, some of the people still in power might be implicated in the crimes attributed to Mr Bashir, including attempts to destroy two ethnic groups loyal to rebels opposed to the Sudanese regime. But the military did acknowledge a future civilian government might choose to deal with the matter differently. Backdoor discussions will be taking place with various international stakeholders to obtain some international support - and the extradition of this court’s most high-profile fugitive might be a powerful negotiation card. The African Union could be a key player here - which has consistently "defended" the former president and sought to undermine the legitimacy of the ICC. It’s too early, and situation still too volatile, to say with any certainty whether a man whose iron grip on power was until relatively recently considered un-removable will ever find himself facing international justice. The court is for now staying silent - in public at least. The prosecutor is undoubtedly dusting off case files and trying to ascertain whether investigators will, for the first time ever, actually be able to visit the region to try to gather evidence of crimes that were allegedly committed years ago. A radio station run by the United Nations' mission in South Sudan reports that commercial flights in and out of the main airport in the capital, Juba, have been suspended or delayed following Thursday's coup in Sudan. The military council that toppled Sudan President Omar al-Bashir announced the closure of the airspace. Deposed Sudan President Omar al-Bashir is the latest leader to be forced out of power because of an economic crisis, Bloomberg reports. Mr Bashir's inability to manage a shortage of foreign exchange that sent inflation soaring and hammered living standards was the cause for his downfall, the report says. Protests against his government began in December and were mostly about economic issues but later morphed into pressure to remove him from office. The same issues forced long-standing rulers from Algeria to Zimbabwe to leave office. Sudan’s economic woes can be traced back to the secession of South Sudan in 2011, which saw it lose almost all its oil fields and 60% of fiscal revenue. Jumia is listing up to 18% of its shares, giving it "unicorn" status - a technology start-up worth $1bn-plus. It is the first tech start-up from Africa to float in New York. A man in Malawi was released from custody on Thursday after spending two days in jail for saying the first lady, Gertrude Mutharika, looked like a computer-animated Hollywood character, news site Malawi 24 reports. Another site Nyasa Times reports that the man, Tumpale Mwakibinga, likened Mrs Mutharika to Rango, a pet chameleon voiced by Johnny Depp in the 2011 film. A magistrate court in Blantyre granted him bail of $140 (£106) and ordered him not to post anything on social media relating to the first lady, the reports say. According to Malawi 24, his trial is due to start on 31 May, 10 days after elections in which President Peter Mutharika is seeking a second term. A Twitter user shared an image of the first lady and Rango. Reports from Kenya say that suspected Islamist militants have killed a police officer and abducted two Cuban doctors working in Mandera County - a volatile area in the north-east of the country. Kenyan media reports say the gunmen, who are suspected to be al-Shabab militants, are believed to have taken their hostages to neighbouring Somalia. Al-Shabab has conducted frequent assaults in Mandera, which borders Somalia, to put pressure on the Kenyan government to withdraw its troops from Somalia. There's increased security in the Algerian capital, Algiers, where mass protests are again planned. Demonstrators, who have gathered every Friday for the past two months, want the removal of the interim head of state, Abdelkader Bensalah. He was appointed earlier this week after the resignation of the veteran leader, Abdelaziz Bouteflika. Mr Bensalah, 77, has promised not to contest elections scheduled for early July. But the protesters say he can't be trusted. We will continue to monitor developments in Sudan but we also want to keep you up to date with other stories from continent. "Bashir will be tried in our judicial system," Lt Gen Omar Zain al-Abidin has told a just concluded media briefing. "We will have zero tolerance for those who kill citizens," he said. He added that no Sudanese will be extradited to face trial in a foreign court as long as the military council was in power, but added that a future civilian government might choose to deal with the matter differently. Mr Bashir was indicted by the International Criminal Court (ICC) on charges of crimes against humanity and war crimes in Darfur, in the west of the country. The conflict began in 2003 after rebels took up arms alleging the government was discriminating people from the region. Hundreds of thousands were killed in the crisis. "Former Sudan President Omar al-Bashir is in custody", Lt Gen Omar Zain al-Abidin, from the military council, has told a press conference, answering a question about the whereabouts of the longtime ruler. A Twitter user has shared a video of protesters chanting in the early hours of Friday as they defied a 22:00 to 04:00 local time curfew that was imposed by military authorities who deposed President Omar al-Bashir.